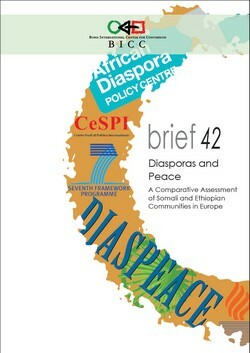 BICC brief 42 "Diasporas and Peace: A Comparative Assessment of Somali and Ethiopian communities in Europe" is a DIASPEACE working paper. DIASPEACE (Diasporas for Peace: Patterns, Trends and Potential of Long-distance Diaspora Involvement in Conflict Settings) is a three-year research project looking into how diaspora groups can foster peace and development in their countries of origin. Synthesis and dissemination of the research findings.This research project aims to generate new knowledge to better understand diasporas` potentials, expectations and experiences as bridge builders between countries of residence and countries of origin. The project is funded by the European Commission under the 7th Framework Research Programme. The research team was established by the University of Jyväskylä and consists of the University of Jyväskylä (JYU), Finland, the Bonn International Center for Conversion (BICC), Germany, Max Planck Institute for Social Anthropology (MPI), Germany, Centro Studi Politica Internazionale (CeSPI), Italy, International Peace Research Institute, Oslo (PRIO), Norway, African Diaspora Policy Centre (ADPC), Netherlands, Forum for Social Studies (FSS), Ethiopia, Academy for Peace and Development (APD), Somalia.